1. In a pot bring half of the coconut milk and the water to boil. 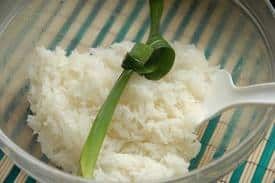 Reduce heat and add sticky rice, sugar and salt. 2. Cover the rice and let simmer for 20 minutes.